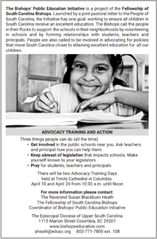 The Fellowship of South Carolina Bishops, including our Bishop Skip Adams, is asking churches to join in prayer on April 15 for South Carolina's public schools. Bulletin inserts for churches to download and print are provided here. The inserts include prayers for public education that can be used in Sunday liturgies, as well as information on how people can help with advocacy efforts for public schools. The Episcopal Church in South Carolina is a member of the Fellowship of South Carolina Bishops (formerly known as LARCUM), a special ecumenical relationship among bishops and the churches they lead in South Carolina. ​ Download the service bulletin here. In April of 2014 we issued a Statement on Public Education to the People of South Carolina. One of the goals of this statement was to name our belief that all children are created in the image of God and entitled to an excellent education. We know you share this belief. We recognize the work you as a body are doing to ensure all of our children receive the educational opportunities which are theirright. Overthe past few years, we have been gratified to join with you as partners in this work. Knowing the many demands on you, we pray for you daily, individually, and corporately, as we gather to worship each week. We commend you for all that you do to better education in South Carolina. Yet despite these efforts, we are still a long way from reaching the goal of excellent education for all of our children. Inequity in education delivery in our state cannot be remedied by the Legislature alone. The Courts cannot correct this injustice alone. Only together can we make a difference for the children of South Carolina. In light of the recent Supreme Court decision to end oversight of progress made, especially in rural schools, we renew our call to people of faith to join us in support of flourishing education for all children. It is now time for us to act where progress is on hold or stalled. We reaffirm our commitment of our time to and resources toward securing a firstrate education for each child in South Carolina. The people of our congregations are resources, hundreds of whom tutor and mentor children. We can also call people into the vocation of teaching. We can support them when they respond to this call. We will continue to encourage people to pursue teaching as a vocation. We will freely offer the profession the respect it warrants. Like you, we are aware of the hurdles for recruiting and retaining the best teachers: inadequate salaries, support of teachers and professional development. We seek action and improvement in all of these areas. For example, we know as you do, that teacher salaries in SC fell from 39th lowest in the nation in 2013-2014 to 47th lowest in 2015-2016. It is clear that we must reverse this decline and compensate teachers at a competitive level. We realize that the availability of technology is uneven in our school districts. Therefore, we support the Learning Management System and other technological infrastructure in our school districts where these resources are lacking. We believe it is our moral duty, and yours, to improve access to technology and excellent teachers in every classroom, because children without these resources will forever be behind those who have them. We recognize the challenges of the delivery in all of these areas. Collaboration among districts will improve prospects of teachers and students in compromised parts of our State. We commend those who work across district lines to collaborate and consolidate resources. We stand ready to encourage these efforts in any way possible. We know this work will require all of us. We are here to work with you. We are calling on you to give this issue your greatest attention. We invite you to call on us. “You are the light of the world” (Matt. 5:13-16). Jesus of Nazareth used this simple image to inspire his followers to make a difference in the world. We are bishops of the Lutheran, Episcopal, Roman Catholic, and United Methodist Churches in the state of South Carolina. As shepherds of our churches, we are charged to lead the faithful in ways that direct our energies to the building up of the Kingdom of God and to make a difference around us. We believe that Jesus’ desire for the unity of his followers (John 17: 20-23) calls us to work together, and we are conscious as well that “no one should seek his own advantage, but that of his neighbor.” (1 Corinthians 10: 24). In support of the American experiment in democracy, our nation has realized that education is an essential component to equipping members of society who can in turn help lead the United States of America into a better future. The family remains the foundation of our society’s ability to nurture and develop people of character. Our congregational leaders and people work constantly to empower and lift up families, and we believe this contribution to the good of society — together with the efforts of all religious communities — is one of our most important contributions to our state. Public education is also an essential component of ensuring that the people of our state are formed to be good citizens, prepared to be contributors to our economy, and given passion for the common good of society. Individual school districts in partnership with the State of South Carolina are primarily responsible for ensuring that the opportunity for a complete and empowering education is available to every child in our state. Unfortunately, our state is marked by disparities in the delivery of education. Many school districts are hampered by a scarcity of resources because they are located in economically challenged, often rural, counties in our state. We believe there is indeed a “Corridor of Shame” in our state. Crumbling buildings, inadequate funding, and low expectations mark too many districts at a time when a 21st Century economy demands more of our people. How can the next generation rise to the challenge of this day and age when they are not given the superior education they deserve? Even in the most successful of school districts, too many students underachieve, or worse, fall through the cracks and do not achieve success. All too easily they can become caught in the grip of poverty. We, as pastoral leaders, pledge our commitment to support the full flourishing of public education in South Carolina. We ask our congregations — as well as all people of good will— to offer what we can to lift up our schools and those students who face hurdles to reach the best they can achieve in their education. Congregations and members of our churches already offer tutoring, mentoring, supplies, and expressions of appreciation to our schools. We pledge ourselves and the resources we are able to engage through our congregations to address concrete ways to support public education in an intentional way over the next five years and beyond. In this effort, we welcome partnerships with all religious communities and people who share our concerns. Over time, we also pledge to engage in a dialogue with our state legislators to craft and support initiatives to improve public education, especially where these issues are related to the areas of our state with schools that are not equipped to provide a superior education. Finally, we commit ourselves to pray for our state’s leaders, educators, and students. We are convinced prayer that trusts God and longs for insight helps bring clarity regarding what is important and strength to make a difference for what is good. We invite our congregants and all people of good will to join us in prayerfully discerning how God calls us to make a difference—to be light for our world—in educating students of our state so that they will not only be good members of society, but empowered for their journey to a fuller life.